Well I’ve completed the top of my liberated baby quilt. 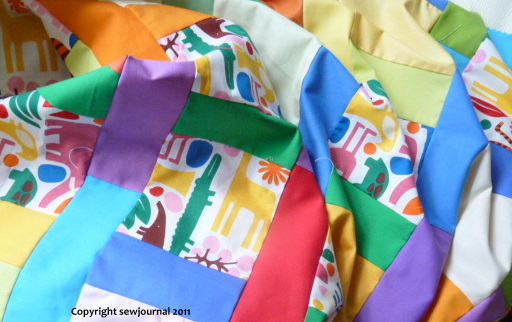 I started with the 30cm of 2d Zoo fabric and a charm pack of Kona warm solids that Mary in Canada had sent me. I didn’t have enough to make a regular pattern quilt and it also wouldn’t have been big enough so I added some “crazy/liberated” sashing using a Robert Kauffman brights jelly roll I had. I’ve been wondering how best to reply to your comments, when they need it. If I send you an email then no one else on the list gets to see the answer. If I post to the list and you haven’t subscribed to the comments then you won’t necessarily see that I’ve answered you. I’d really like to know which way is the preferred method for my commenters. I really enjoy your comments and read each and every one so I want to encourage you to keep commenting. Please leave a comment and let me know what you think. If I ask a question in a blog comment, or make a comment that I think might get a response, I revisit the blog in a day or two to see if there is a reply. I don’t expect an email response. Lol I think you have two good answers that seem to work! First…if I leave a comment on a blog, I don’t really expect a response. If I ask a question, I’d prefer an email…mainly because I surf a lot of blogs and don’t always know where I’ve been! 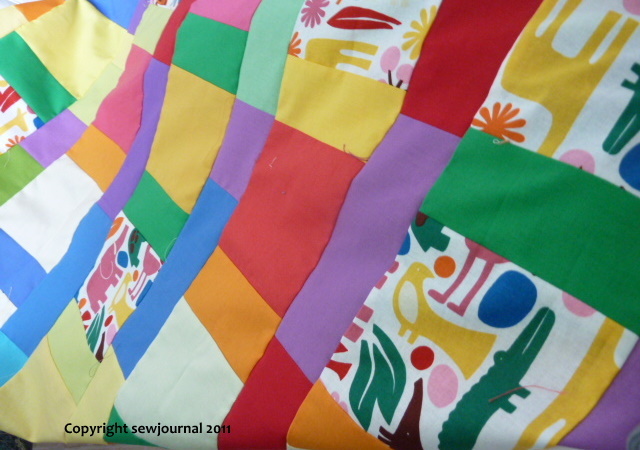 That’s a great idea for the quilting but it assumes a competence with the machine that I don’t have unfortunately. 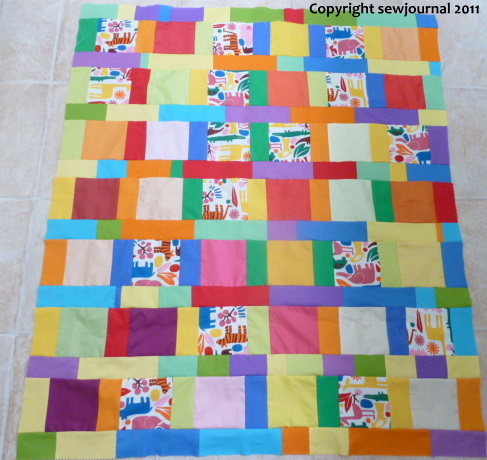 Love your nice bright cot quilt, well done! As for comments, most people don’t expect a personal reply, but sometimes bloggers reply on their original blog comments (hope that makes sense). If you feel a personal reply is warranted, then it would be nice to get in touch by email. I like Deborah’s comment and suggestion. I read a lot of blogs and if I leave a comment with a question, it would be nice to know that it was answered and I should go back and read it. I visit you daily Munaiba, so don’t need an email response unless it’s personal…. And I love your quilt. I have some Wizard of Oz fabrics that don’t work together at all, but which have to be made into a quilt for a fan (don’t you just love daughters who volunteer your services!). Maybe these are what I should get ‘liberated’ with! Your quilt is lovely Hope you don’t mind Munaiba if I ‘borrow’ your idea, and as DIL is due mid February but is having contractions now, so need to pull the finger out and quickly make the quilt and nappy bag. Nappy bag pieces all cut and ready to start on. Quilt fabric in the washing machine. It could be ‘false’ labour but she has been experiencing them since Friday. Feel free Fran. I’d love to see the finished quilt. What a great quilt it turned out to be. I’m not sure how your website works so just do whatever you are comfortable with I guess. Sorry I couldn’t suggest anything constructive.